Performance management in an organization includes activities which ensure that goals are consistently being met in an effective and efficient manner. It focuses on the performance of the organization, department, employees, or even the production processes which produces the product or service, as well as many other areas. It is also known as a process by which the organization aligns the resources, systems and employees to strategic objectives and priorities. An organization aspiring for success needs in place the process of performance management. Aims of the performance management in the organization are (i) to make the performance of the organization visible, (ii) to drive the management and the employees to take actions, and (iii) to provide timely feedback on the effect of the actions for taking corrective measures. Performance management highlights the visible performance gaps in the organization. It creates increased pressure on the management and the employees for improvement in the performance level. It identifies the areas of improvement in the organization. It helps the organization for sustaining the continuous improvement in quality, cost, safety, and in meeting the customer requirements. Performance management is a structured visual approach to monitoring of the organizational performance, highlighting issues and reacting to them in a timely manner. Performance management system is required in the organization for the purpose of meeting obligations to customers, employees, shareholders and other stakeholders. 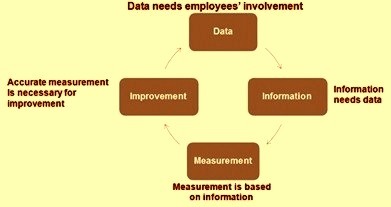 Collection and analyzing of data is an important necessity in the process of the performance management. Accuracy of the data for the performance indicators is necessary for the stimulation of the improvement activities in the organization. The data-improvement cycle is given below in Fig 1. Performance management is a tool to ensure effective management in the organization. It is the process which is used by the management to create and sustain a work environment which (i) values continuous improvement, (ii) adapts well to change, (ii) strives to attain ambitious goals, (iv) encourages creativity amongst the employees, (v) promotes learning and professional development of the employees, and (vi) motivate employees to perform with aims for achievement of the organizational goals. For process management to be effective, it is necessary that the employees reconcile their personal goals with organizational goals. Performance management has the following important features. Quantity – It specifies how much work must be completed within a certain period of time. Quality – It describes how well the work must be accomplished such as accuracy, precision, appearance, or effectiveness etc. Timeliness – The time period during which the work need to be completed. Effective use of resources – Effective utilization of resources is essential for efficiency and productivity. Efficiency of the effort – Effort is necessary for the performance to be achieved. However required effort need to be put without any wastage for efficient performance. Manner of performance – It describes conditions under which the performance is to be achieved. These conditions are to be challenging in nature so that they provide motivation for the employees to perform. Process discipline – Performance is to be achieved following procedures, rules and safety norms and without violation of the process discipline. Performance management is the systematic process by which the management and the employees of the organization strive for improving organizational effectiveness for the accomplishment of the organizational mission and goals. It is the single largest contributor to organizational effectiveness. Organizational success is dependent on how efficiently the organization is handling its own performance as well as the performance of its employees. 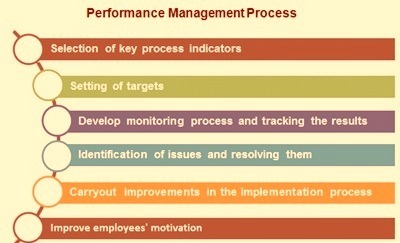 Performance management process has six major components (Fig 2). These are (i) selection of the key process indicators, (ii) setting of the targets, (iii) developing of the monitoring process and tracking of the results, (iv) identification of the issues affecting the performance and solving them, (v) taking of the corrective measures and carrying out improvements during the implementation of the process, and (vi) identifying the required motivation and building them in the performance management process for the motivation of the employees. The key elements of a performance management system include monitoring and action centred management. There need to be focus of the management on both the elements. For monitoring key tools are (i) visible key process indicators with targets, (ii) cascaded objectives for all the employees’ groups, (iii) process tracking for all the areas, (iv) a central information system, and (v) regular review system. The action centred system includes (i) delegation of power for the employees for taking action at the needed level, (ii) formal and well understood escalation procedure, (iii) responsibilities oriented standard procedures, (iv) active use of PDCA (plan-develop-check-act) cycle, and (v) actions towards continuous improvement. The performance management is a process which needs time for planning and implementation. The process can save time and energy both for the management and the employees. Most importantly, the process is a very effective motivator both for the management and the employees, since it helps in the achievement of their own objectives as well as the objectives of the organization which in turn propels the organization on the path of success. Performance management is a continuous process. It involves a never-ending process of setting goals and objectives, observing performance, and giving and receiving of the continuous feedback. Performance management requires the organizational management to ensure that the employees’ activities and outputs are congruent with the organizational goals and, consequently, help the organization gain a competitive advantage. It therefore creates a direct link between employees’ performance and organizational goals, and makes the employees’ contribution to the organization explicit. For an effective performance, the organization is to plan the work in advance. Planning of the work includes setting of the performance expectations and goals. To achieve the desirable performance levels, it becomes necessary to channel the efforts of the employees towards achievement of the organizational objectives. Getting employees involved in the planning process help them to understand the goals of the organization, what needs to be done, why it needs to be done, and how well it should be done. Further performance plans are to be flexible so that they can be adjusted for any change in the operating environment. In the performance management, managing of the employee or system performance and aligning their objectives facilitates the effective delivery of strategic and operational goals. In many organizations there exist a clear and immediate correlation between the using of the performance management programs and improved organizational results. The effects of performance management process can have positive or negative effect because of the characteristics of performance management systems and the contexts into which they are implemented play an important role to the success or failure of performance management. Since the performance of the employees is an important aspect of the organizational performance, the employees’ performance appraisal is a very important feature in the performance management process. The requirements for planning employees’ performance include establishing the elements and standards of their performance appraisal plans. Performance elements and standards are to be measurable, understandable, verifiable, equitable, and achievable. Through critical elements, employees are held accountable as individuals for work assignments or responsibilities. Employees’ training as well as their action and behaviour are to be an important feature of the employees’ performance appraisal. However equating of the performance management with performance appraisal is not accurate. Performance management is the term used to refer to activities, tools, processes, and programs that the organization creates or applies to manage the performance of the employees, teams, departments, and other organizational units within their organizational influence. In contrast, performance appraisal refers to the act of appraising or evaluating performance during a given performance period to determine how well an employee, a vendor or an organizational unit has performed relative to agreed objectives or goals, and this is only one of many important activities within the overall concept of performance management. An effective performance management process is an ongoing process which sets the foundation that aligns the efforts of the management and the employees with the goals of the organization. This is achieved by the following. By linking work efforts of the individual employee with the organization’s mission and objectives. Both the employee and the management are to understand how the job contributes to the success of the organization. By focusing attention on the setting of the clear performance expectations, it becomes possible to know what need to be done for the success of the job. Through the use of objectives, standards, performance dimensions, and other measures, performance management focuses on the efforts. This helps the management to get done what needs to be done and provides a solid rationale for eliminating work that is no longer useful. Through regular check-in and monitoring, which include status updates and feedbacks, it promotes flexibility, allowing management and the employees to identify problems early and change the course of a work assignment if needed. Effective communication between the management and the employees in support of accomplishing the strategic objectives of the organization is essential for the achievement of the desired level of the performance. The communication process is to be continuous and must include clarifying of the expectations, setting of the objectives, identifying of the goals, continuous monitoring, and reviewing of the results. Employees’ training is an essential aspect for the organizational performance. Trained employees carry out the job effectively as well as efficiently. In efficient and effective organizations, managers and employees have been practicing good performance management naturally all their lives, executing well each key component of the performance management process. Goals are set and work is planned routinely. Progress toward those goals is measured and employees get feedback. High standards are set, but care is also taken to develop the skills needed to reach them. Formal and informal rewards are used to recognize the behaviours and results that accomplish the mission. All the component processes working together and supporting each other achieve natural, effective performance management. Performance management is a tool for the organizational success. Benefits of implementing proper process management process in the organization include the following. There are direct financial gains which include growth in revenue, reduced cost of operation, and reduction in the costs of project overruns. Employees’ action and behaviour get aligned to organizational objectives and goals. Performance management decreases the time it takes to create strategic or operational changes by communicating the changes through a new set of goals. It motivates the employees for higher performance which in turn optimizes their incentive earnings. It improves employee engagement because everyone understands how they are directly contributing for the organization to achieve high level goals. It creates transparency in achievement of goals. Employees’ development programs are better aligned directly towards the achievement of the organizational goals. There is improved management control which is flexible and responsive to the organizational needs. It results into simplification of the communication process and the clarity of the strategic goals of the organization becomes better with the employees. It results into better and systematic recording of the data for effective monitoring of the parameters.